S'mores are a favorite in this house. Today it was way too hot out to make them on the fire pit, so we made an indoor s'mores treat from Lovin' From the Oven. 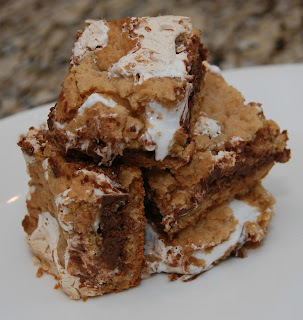 These s'mores cookie bars are just as delicious as the standard s'more, but less messy because they use marshmallow fluff and not regular marshmallows. They are a crowd pleaser every time I make them. 1. Preheat oven to 350°F. Grease an 8-inch square baking pan (I used a 9-inch pan). 2. In a large bowl, cream together butter and sugar until light. Beat in egg and vanilla. In a small bowl, whisk together flour, graham cracker crumbs, baking powder and salt. Add to butter mixture and mix at a low speed until combined. 3. Divide dough in half and press half of dough into an even layer on the bottom of the prepared pan. 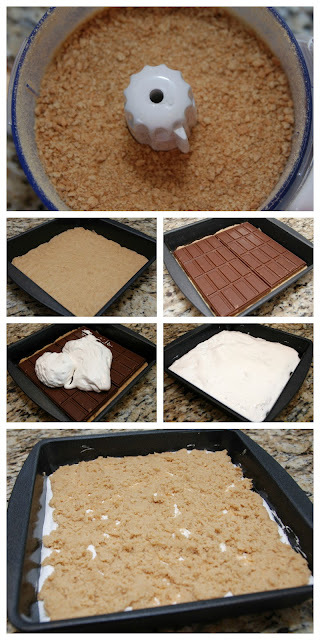 Place chocolate bars over dough. 2 king-sized Hershey’s bars should fit perfectly side by side, but break the chocolate (if necessary) to get it to fit in a single layer no more than 1/4 inch thick. Spread chocolate with marshmallow creme or fluff. Place remaining dough in a single layer on top of the fluff (most easily achieved by flattening the dough into small shingles and laying them together). 4. Bake for 30 to 35 minutes, until lightly browned. Cool completely before cutting into bars.